After all these years, Colin Baker finally has the chance he deserved to send off the Sixth Doctor under his own terms, bravely and with all his extremes of anger, compassion and eloquence. Not that this is Colin’s last adventure. Big Finish’s main job is to tell new stories about past Doctors whose beginnings and endings we know. It’s just that he never had his regeneration story, a powerful moment when we pause to salute a Doctor for who he truly is. 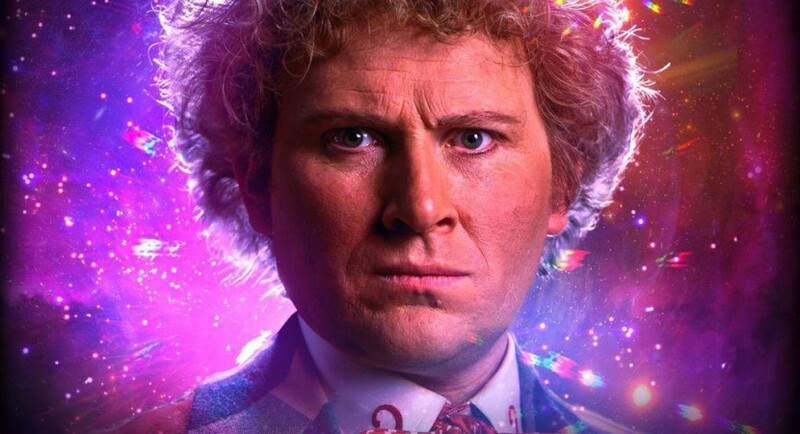 I have one or two quibbles with The Brink of Death, but the important thing is that it honours the Sixth Doctor with respect and sympathy, the polar opposite of Twin Dilemma. It gives Colin a chance to demonstrate the greatness of the character that we’ve come to love through the audio medium (unless you’re one of the enlightened fans who took to him back in the ’80s; to my shame I did not). This audio opens with Mel, the mature Big Finish Mel who’s fully fleshed out into a friendly and self-possessed tech head rather than an “Oh, Doctor!” screamer. It’s early in her friendship with the Doctor, before she really knows him very well, but they already have a comfortable dynamic. At least, they do for the few scenes where they’re together. … just kidding. That would be a rather short regeneration story, wouldn’t it? That’s when the action really begins. The pieces the Valeyard has been moving into place during the previous three stories come to fruition. He traps the Doctor in such a way that his only hope is to win the trust of a skeptical stranger. Which is why the audio’s official description is a little misleading: “The Doctor and Mel face the final confrontation with the Valeyard – and the Doctor must make the ultimate sacrifice.” Nope. The Big Finish companions, Flip, EU Jago & Litefoot and Charley confronted the Valeyard in the Last Adventure. But Mel? Not so much. She’s still in the story, and she does get some Valeyard time, sort of, but she and the Sixth Doctor don’t face him together. That, I think, was a mistake, just as I think it was a mistake to introduce Constance in End of the Line. Luckily, the locum companion, Genesta, is instantly likable: a lowly CIA technician with an attitude problem and a brash Yorkshire accent. She’s a breath of fresh air in what is necessarily an ominous story. The heart of this adventure is the Sixth’s Doctor’s desperate battle of wits with the Valeyard, who has him pinned to the floor, almost literally, before the opening theme music even starts. The Valeyard is diabolical, ruthless, and a little bit daft in the way Delgado’s Master was. His plan threatens far more than the Doctor: the lives of whole races stand in the balance. Our hero is in a bad way, and he has only a rapidly-closing window of time in which to rescue himself. If he fails, he’ll lose far more than his life. He undergoes most the stages of loss: denial, bargaining, anger, grief— but never, ever does he give in. Stripped of ship and friends, he fights with the only weapons he has left: his wits and his words. For the Sixth Doctor, even more than Seven at his most rrrrrrrhetorical, has a way with words. They are on full display in this story, as they should be. Colin conveys the Doctor’s sheer desperation and distress, as well as his stubborn will and his love for his friends, with a standout performance. We can really feel how the Doctor is backed into a corner, down on one knee with metaphorical hounds trying to bring him down. And the choice he makes to win that battle shows just how far he’s come since The Twin Dilemma. As always, classic Who handles each regeneration uniquely and a little differently, rather than the monotonous standardisation of New Who. I liked the idea that Big Finish was going for here, but the drawback is that Colin had some lovely last words, and then… one more small scene after them, so that his technically-the-last words are not quite as powerful. My other minor quibble is that the Valeyard’s diabolical plan requires a midichlorian-like plot contrivance. It gets the job done plotwise, it’s just a mite clunky. Thus: the plot is a 7, but Colin’s performance is a resounding 9 (I’d say 10, but there are a few unsurpassable moments between him and Maggie Stables). As I mentioned above, Mel doesn’t have much to do in this story besides develop some nagging doubts about the Doctor and get knocked out in time for Time and the Rani. She flashes some plucky derring-do before the opening credits, but she spends the bulk of the story trying and failing to figure out why the Doctor seems a little off. I kept waiting for her to catch on, pull the wool over the Valeyard’s eyes and throw Sixie a lifeline (see Nyssa literally flying the TARDIS back to find her real Doctor after seeing through an imposter). Bonnie’s good enough in audio that her scenes with the Valyard are compelling, but she doesn’t have enough of a purpose in this story. On the flip side, I like the fact that the Doctor finds a way to get a message to the TARDIS. The Valeyard strips the Doctor of the two things he relies on, friendship and his beloved ship, yet doesn’t realise that separation is absolutely crucial for keeping the Doctor helpless. So Sixie contrives to make a new friend and contact his ship. As soon as he does that, he’s won. Speaking of his new friend, it’s a tantalising question when, exactly, Genesta becomes the Valeyard. In the first scenes, when she’s giving backtalk to her superior and Sixie isn’t even around to hear or see her, it’s certainly the real Genesta. I think she continues to be “real” as long as she’s calling the Valeyard derisive names (knackyard, boneyard), echoing the Doctor’s mockery in Trial of a Timelord. Late in this story, she says “Valeyard” and argues that the Doctor has been defeated by him. That has to be the Valeyard toying with him. In fact, it’s pretty clearly not Genesta in the telepathic landscape when the Doctor’s talking to the lava-critters inhabiting his ship, a slightly clunky plot contrivance). I think she’s still Genesta when the Doctor thanks her for calling him “Doctor,” but I’m not certain. I do not like Nick Brigg’s retcon, turning the Valeyard into a black ops project of the CIA. No. Just no. I’m going to have to listen again and discover when, exactly, Genesta introduces that idea. If she’s been replaced by the Valeyard by that time, then it’s part of his mindgames, toying with the Doctor so that he’ll fritter away the time he has left on wild goose chases. I’m also baffled at how replacing dead Time Lords whose minds are stored in the matrix can replace living Time Lords. I suspect this may have been answered at some point during the audio, and I just missed it. It’s a satisfactorily diabolical scheme, even if the plot justification for it is a little shaky. I do like the way this audio inverts elements of early Six. In Twin Dilemma, he throttled a companion. In this, he kills himself to save a companion and the Time Lord race. It’s the only time he’s sacrificed himself to save the Time Lords, isn’t it? A courageous irony, since they tormented him more than any other incarnation until Twelve. Valeyard: What about your precious moral scruples? Six: They died with me. Brilliant and chilling. The Doctor saves the Time Lords in this story, but he has to wipe out the Valeyard’s lava midichlorians to do it. Needs must, but it’s one more genocide. And now I’m going to (Re)Generation Con to see Colin Baker for the first time, and I want to give him a huge hug for the Doctor who terrified me as a girl, but whom I’ve come to love as much as any thanks to the big-hearted fellow who’s given him the magnificent voice he always deserved.